Our 10" Program Tassel is offered in 20 fantastic colors. Our program tassels are a great added touch for your programs, invitations and so much more! We guarantee your satisfaction, offering only the highest quality tassel sold much cheaper than our competitors online. You will love our floss program tassel! We have NO MINIMUM required! 10" Program Tassel / 20 Colors! You are looking at a beautiful program tassel. This program tassel has a 10" loop with a 2" FLOSS tassel. This size will fit the binding of a program or invitation that is 8" to 9 3/4" long. There is an adjustable slide on the program tassel that will allow you to tighten the loop for a perfect fit. 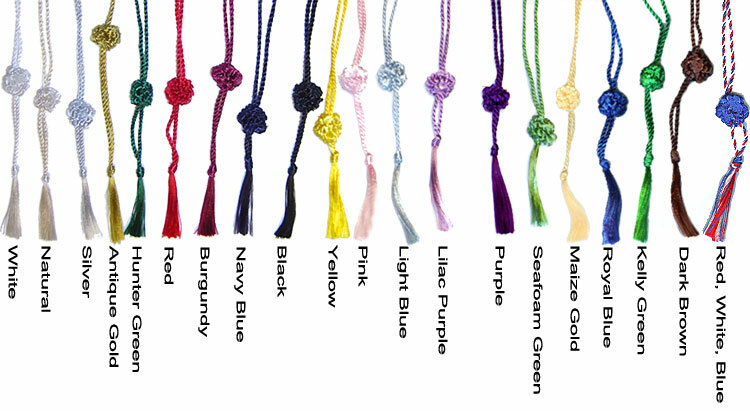 Currently this floss program tassel is offered and stocked in the 20 colors shown below. The color chart shows the colors offered in the same order as the drop down menu where you make your color selection. If you order 500 or more of the same color program tassel, the price is $.22 each. If you order 1000 or more of the same color program tassel the price is $.21 each. If you are interested in ordering a larger quantity, please call us!